Ryan Donato (right) celebrates after scoring against Slovakia. GANGNEUNG, South Korea — Just 11 days ago, they were on opposite sides of the ice, bitter college rivals aiming at the same Beanpot. Neither Harvard’s Ryan Donato nor Boston University’s Jordan Greenway would ultimately see his team go home with the coveted prize, won instead in historic fashion by Northeastern. But the two college players have gotten themselves an equally lasting lifelong memory, departing after their epic double-overtime semifinal Beanpot game (won by Greenway and BU) as teammates on the US Olympic hockey team. And two games into the tournament in PyeongChang, they are making it clear they belong on the international stage. One game after Greenway scored his first Olympic goal, Donato did him one better, scoring twice Friday to lead the US past Slovakia, 2-1. His two power-play goals eased the disappointment of the opening loss to Slovenia — one wicked wrist shot and one nifty turnaround to get the Americans ready for Saturday’s pivotal seeding game against Russia. 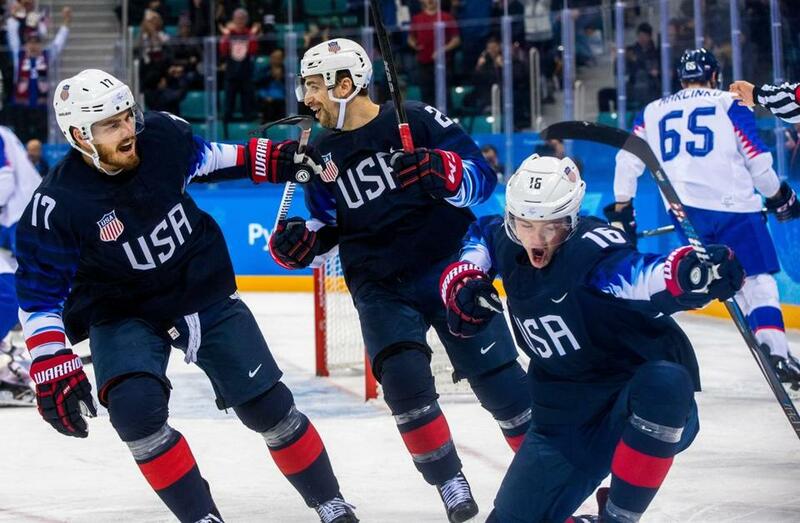 For all the hand-wringing over how this tournament would go without NHL players, for all the criticism hurled at the quality of the product over the early games, there is something to be said for the pure joy, exuberance, and wide-eyed wonder seen through the eyes of these newest Olympians. Even better is seeing them prove they’re not just happy to be here, but ready to compete. “That [second one] was a goal scorer’s goal,” said teammate Troy Terry (also a college star, at Denver) of Donato’s third-period winner, which came just seven seconds after Slovakia was penalized for too many men on the ice. “I mean, he spun and got around the stick and tucked it. It was a great play. For Donato, a Scituate native and Bruins prospect taken in the second round of the 2014 draft, it’s been a life game, one he’s grown up around as the son of ex-NHL veteran Ted Donato. Though Ted, a longtime Bruin who just happens to be Ryan’s coach now at Harvard, is not here at the Olympics (Ryan’s mother, sister, and grandmother, as well as a few close friends, are here), father and son have burned plenty of cellphone minutes discussing the games. It was a piece of advice from his dad that echoed in Ryan’s head as soon as he eyed that first goal. Team USA coach Tony Granato, also an NCAA coach for Wisconsin, didn’t mind the coaching assist, though he winked at the notion that Ryan hadn’t heard that message already. Those who know their US Olympic hockey history remember that the NHL players began competing in 1998, just six years after Ted Donato was on the 1992 team that finished fourth in Albertville. With 7 points in eight games, Ted was one of three men tied for the team scoring lead. For Ryan to pick up where his dad left off is an opportunity that they are doing their best to relish, riding the serendipitous timing of the NHL’s decision, Ryan’s availability as a Harvard junior, and the combination of speed, skill, and savvy that made him a natural choice for the roster. For Donato and Greenway, their moment is now. Donato and Greenway have combined for three of Team USA’s four goals, one winger with blazing speed making his mark against Slovakia, one mammoth center with ridiculous size and strength doing so against Slovenia. For two former rivals loving their new life as teammates, that’s what matters now. “It’s funny just to have that Beanpot connection,” Donato said. “I’ve grown up playing against Jordan in different tournaments. And maybe, just maybe, take a trip to the podium. Tara Sullivan is a Globe columnist. She can be reached at tara.sullivan@globe.com.